Having a professional photographer take your engagement portrait is important. It can be a great way to get comfortable being photographed with your soon-to-be spouse, and it’s also a great way to get to know your photographer. If you enjoy working with your photographer and you like the engagement portraits, chances are good you’ve found the right photographer for your wedding! But there’s more to it than that! 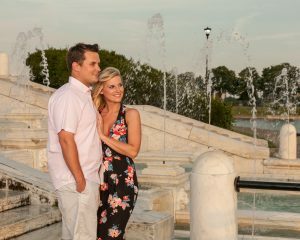 An engagement portrait session allows the photographer to observe the two of you being yourselves: the way you interact with each other- the little looks you give one another…learning who you really are allows a professional photographer to portray you in a natural way that makes you look your best. A great engagement portrait shows your personality, brings out your best qualities and hides your weak points. (Yes, most people believe they have maybe one or two…). A professional photographer can advise you on hair, make-up, clothing and poses: all the things that affect how you look in photos. Everyone has a “good side”, and a pro will find it and make the most of it! If you’re engaged, you should schedule a portrait session soon! Fall is a very popular time for engagement portraits, and with good reason. Fall colors can add beauty to an outdoor portrait, cooler weather means you’re not over-heated, and fall clothing is often more flattering than summer clothes.